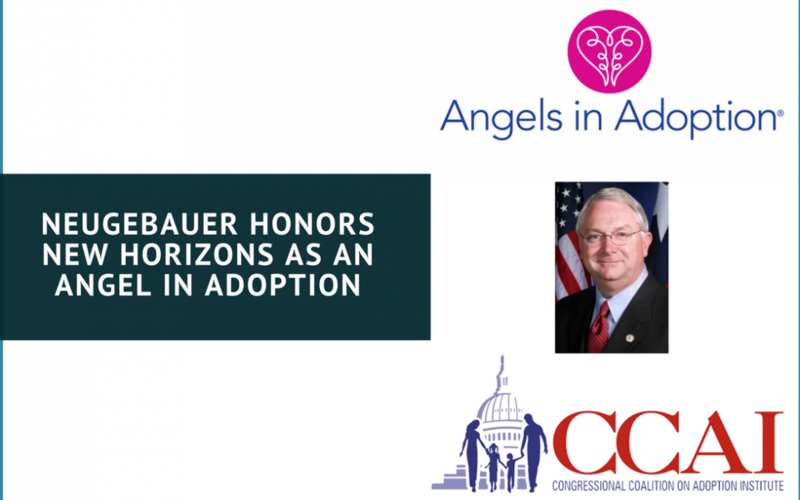 WASHINGTON, DC  Congressman Randy Neugebauer (R-TX) released the following statement today honoring New Horizons in Abilene as a 2010 Angel in Adoption for their outstanding advocacy of adoption and family care issues. At New Horizons, they work to restore hope to battered spirits by teaching children to face personal challenges as they strive to live successfully in a family and community. This organization also places children in a safe and supportive environment where they can continue to heal and grow. Earlier this year, I had the opportunity to tour the Audrey Grace House, an extension of New Horizons. The Audrey Grace House is the first phase of the Community Center of Care and will provide residential treatment, shelter and support services to Abilene youth and families. NOTE: New Horizons serves the North, West, and Central Texas areas. To learn more about the work being done through New Horizons, please visit https://www.newhorizonsinc.com/. The Angels in Adoption program is the Congressional Coalition on Adoption Institutes signature public awareness campaign and provides an opportunity for all members of the U.S. Congress to honor the good work of their constituents who have enriched the lives of foster children and orphans in the United States and abroad. This year, 140 Angels in Adoption from around the country will be recognized, in addition to several National Angels. For more information on the Angels in Adoption program, please visit Fttp://www.angelsinadoption.org. New Horizons helps children in Texas through counseling, foster care, adoption, and residential treatment. New Horizons Ranch and Center, Inc. DBA New Horizons is a nonprofit, 501(c)(3) organization, tax identification 75-1530340.